How can an industry have process control when one of the key components—anilox volume measurement calibration—is missing? How do you know what your anilox roller volumes are? Who measured them? How were they measured? How do you know these bcm (billion cubic micron) numbers are correct? You don’t! What is the missing piece? Calibration. The Center for Printability at Georgia Southern University has developed a test method to certify the volume of a roller. A certified roller then can be used as a calibration test gauge. Whatever method of volume measurement you want to use, the certified roller would be used to ensure your test device or method is accurate. Yes, roll scopes are calibrated. But they are calibrated using a National Inst. of Standards and Technology (NIST) step gauge. Measuring a ceramic cell is very different from measuring a height change on a flat surface. Calibration lends a certain amount of consistency to the measurement process, no matter what it is. As you will see, volume measurement lacks consistency across the industry. Our purpose was to describe the problem of volume measures, identify a measurement method suitable for laboratory use, and develop a method for certifying anilox volume. A banded mechanical roll was created in brass for the test. Since this anilox was not intended to be a production roller, brass was used because it does not corrode and therefore does not need chroming. The bands are 400-line and 200-line. The volumes for each band will be described in the project tests. The Flexographic Technical Association FIRST specifications describe two measurement systems: a scope system and a liquid volume system. Added to the study was a popular liquid strip volume test. The following three comparisons attempt to answer the question of how well one can rely on the bcm volume stamped on a cylinder. The tests record the consistency of volume measurements based on the person, time, and system. For statistical purposes, each test condition was measured five times. The numbers reported are the average of these measures. Four people were involved in this test. One person was the expert and had several days of practice on each test method. The other three operators were allowed to practice until they were consistent with their results. Question: Are different operators able to produce similar measurement outcomes? 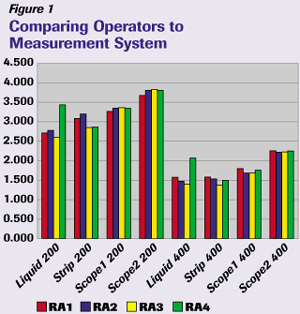 The two test methods that are highly dependent on operator skill (liquid volume and liquid strip) show the largest variation between users (see Figure 1.) The roll scope results are much more consistent among operators but still vary as much as 0.27 bcm at a 3.6 volume and 0.17 bcm at a 1.6 volume. That may not seem like much, but are you buying a 3.6 volume or a 3.87 volume roller? Is that difference important to you when you buy? Conclusion: No matter what system is used, changing operators will effect the volume results. In this test, only the expert conducted the same measure on four different days. Question: Does starting and stopping from day to day change the results? The expert showed he/she was still learning the process for the liquid volume and liquid strip systems on the first day (see Figure 2). 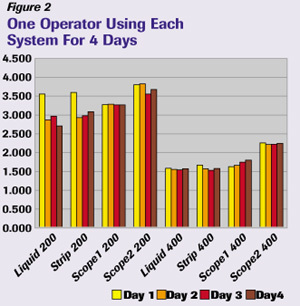 The following three days show more operator consistency for each. The results for the scope systems were mixed as well. 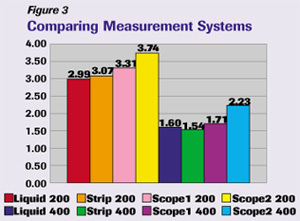 Scope1 was more consistent on the 200-line band, while Scope2 was more consistent on the 400-line band. Conclusion: In relation to most of the measurement systems, the results changed from day to day measuring the same cylinder. Question: Are the volume measurement systems similar in their results? What is a similar result? Anilox cylinder manufacturers are reporting volume numbers to the 0.1 place of a bcm, and some manufacturers are reporting 0.01 bcm numbers, e.g., 4.39 bcm. Keeping this in mind, you decide what is similar. Figure 3 was made by averaging all test data (35 measures) for each system. From low to high on the 200-line, there is a 25% difference in measured volume and on the 400-line, a 51% difference. Even looking at the second highest measurements, the difference is 10%. Conclusion: The systems do not provide similar results based on a 0.1 bcm. Reporting volumes down to the 0.01 bcm seems unnecessary. The Bigger Question: Which one of these numbers is correct? How can a volume number reflect the way ink fills and disperses across a cylinder? A beginning point for measurement is needed — something with a known volume that will be used to check the accuracy of whatever system one wants to use. The systems are not the problem, rather it is the lack of a common starting point. The Center for Printability believes the liquid volume test method is the best for certification. The liquid method provides the most real simulation of applying and wiping ink to an anilox. The center studied the various methods and chose the tools, inks, and transfer papers that provide the most accurate and consistent results. Repeated measures from multiple locations provide highly reliable results. The most desired configuration of a cylinder for certification would be one that is banded with each band no less than 3 in. wide. Ideally, the cylinder would be from the same manufacturer that makes the production cylinders. Once a reliable standard is available, all other measuring devices can be adjusted to read nearly the same. Until this happens, any comparison of anilox volume is suspect. Dr. Donald Armel is a professor of Printing Management at Georgia Southern University and director of the Center for Printability. He can be reached at donarmel@gasou.edu.